New Possibilities & New Dimensions to Textile Cleaning! 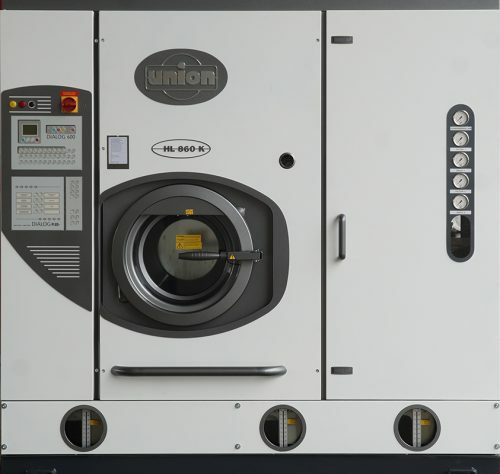 The HL & HP 800K machine is the first line of equipment designed for the SystemK4 Kreussler dry cleaning concept. These machines are optimized to get the best results from the new cleaning system, and can also run any Class III-A solvent. The K Series machines are available in 35 to 90 lb. capacities and utilize a specialized refrigeration system along with a customized air circulation configuration for maximum solvent recovery and quick cycle times, as well as other features. Dermatologically tested skin friendliness with the result “Very Good”. Increase the safety of your business. Inverter controlled drying fan and button trap drying system provides optimal solvent mileage. LED front loading door light. The Brain! It's Indispensable! Union unleashes "The Brain! Dialog Plus™" - the latest advancement in computerized operation technology for drycleaning. It is standard on every HL 800 Series K System. With Dialog Plus™ run different multiple programs without having to change temperature setting or inverter drive speeds. Once the individual programs are entered Dialog Plus™ automatically remembers the settings for you. The Brain is loaded with amazing, time saving features. Multiple (optional) independently functioning high-micron self-cleaning spin disc EcoFilters to assure optimum filtration of both large and small particles for maximum solvent purity. Computer controls automatically pair filter operation for whites, darks or colors according to specific program. Truly Fast, Smart and Clean Idromatic™ Still Cleaning System (optional) completely removes sludge, then automatically pumps out all residue for containerization and safe disposal.